We undertake commissions for bespoke hand embroidery. From wedding accessories and veils to costume for stage and screen. 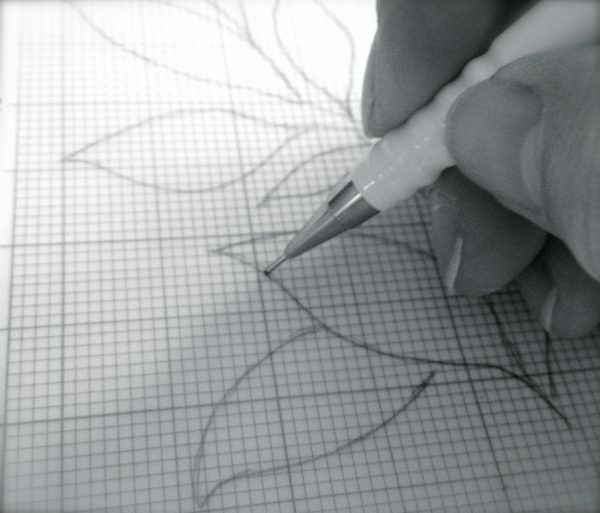 Most of the designs we use are drawn by hand, giving the ability to create almost anything. You can choose from our range of designs or we can work closely with you to realise your own ideas. All of our designs are hand drawn. price and timescale based on the information available. We will start by discussing your ideas, producing a draft design for your approval along with material specifications. Once the draft is approved we will give you a fixed price quotation which will be valid for 30 days. Upon acceptance of the quotation we will request a 50% deposit to cover costs of materials and secure your place in our schedule. Upon receipt of the deposit work is deemed to have commenced. When the item is completed, we will inform you and send a pro forma invoice for the remaining cost. Goods are dispatched to you once payment is received. The price we quote is the price you will pay and will include all materials, labour, packaging, shipping and shipping insurance. All items will arrive in quality boxes with acid free tissue paper designed for long term storage. Storage and cleaning instructions will also be provided. Bespoke items all come with care instructions and a certificate of authenticity. All commissioned work is carried out on a pro forma basis and prices are in GBP sterling. Changes to shipping details which incur additional charges. Changes to the design specifications once work has commenced. Additional charges will be advised in these instances. Customs import charges where applicable if you are ordering from outside the UK. It is the responsibility of the purchaser to make necessary customs arrangements. For a number of reasons we do not undertake work on ready made and existing garments. We are happy to use third party designs as long as the item is for personal use and that you can provide written authority to use the design. Maire Curtis will not undertake to ensure authenticity of a design. You will indemnify us against any infringement of intellectual property rights. Bespoke work cannot be returned. If cancellations are made once work has commenced, Maire Curtis will retain the deposit in order to cover costs of materials and lost orders due to maintaining your place in the schedule. Cancellations must be made to our office address by registered mail. We do not accept cancellations by any other method. Materials remain the property of Maire Curtis until goods are paid in full. Please note that we do not make wedding gowns but we can point you in the right direction.